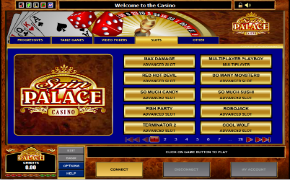 Spin Palace launched in 2001 and since then it became one of the most recognized gambling destinations worldwide. From world-class customer service and a huge portfolio of games to great promotions plus safe and secure banking, Spin Palace Casino ticks off all the boxes when it comes to online entertainment. The richest rewards await you as you start your journey with millions already paid out to lucky players – just check out the latest winners on the homepage and you will notice that players from around the world are striking it lucky every day at Spin Palace Casino. 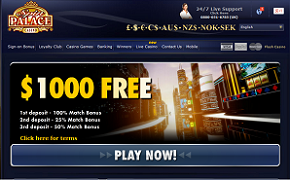 3) 50% match bonus up to 450 C$/€/AUD. Spin Palace offers loads of regular rewards to its loyal customers, including cash and casino credits to weekend getaways and customized gifts. Naturally, the more you play the more Spin Palace you get. Spin Palace offers a great variety of games including blackjack, roulette, video poker, craps, classic slots, video slots, pokies and of course numerous progressive slots. There are also multi-player blackjack and slots tournaments. In total, more than 500 games are on offer with over 350 video slots including fun themed games as well as 243-ways-to-win slots. 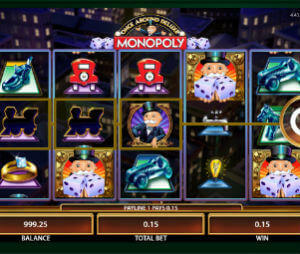 All the games are powered by Microgaming, a leader in the industry of software development. New games are added on a monthly basis, such as the recently released Max Damage and Red Hot Devil slots. Spin Palace also features Microgaming Mega progressive slots, including the famous Mega Moolah slot (which only recently paid an astonishing $3,841,000 jackpot. The games are neatly arranged within the software of the casino according the game group and then sorted alphabetically to make it easier for you to find your favourite game. When joining Spin Palace you will have a choice of either downloading the free software or play direct in your browser via the flash casino. The software does have a lot more games available (over 500) and offers better user experience. Your next step will be to register an account, which is quick and hassle-free, make your first deposit and to redeem your 100% bonus. Spin Palace offers a huge variety of payment options ranging from credit and debit cards to web wallets and pre-paid solutions. As the casino accepts players from almost all over the world, you can also play in the currency of your choice and select the language in which you would like to play in. Using 128-bit SSL encryption technology, Spin Palace ensures that your details are always safe and secure, and being awarded with the eCOGRA Seal of Approval, Spin Palace has been recognized for excellent casino conduct. Deposit & Withdrawl methods: Visa, Bank Wire Transfer, Poli, ClickandBuy, EcoPayz, MasterCard, Neteller, Paysafe Card, Ukash, Visa Debit, Visa Electron, Instadebit, Visa, Entropay, EZIPay, Skrill, eCheck, iDebit. Should you have any questions, contact the support team at Spin Palace, available 24/7 via email, phone or live chat. It’s not easy to find flaws in Spin Palace casino – the games are great, huge mega progressive jackpots, frequent tournaments. The only aspect that they can improve is to make cashouts within 24 hours vs. 48 hours and to start accepting players from UK and US. But we are being picky. If you are from Australia, Canada or New Zealand, this is as good as it gets.